This article takes you through the best electronic drum pads currently on the market. These are extremely versatile electronic instruments that can add a new level of sound to your set. These pads can be used to extend your current setup or they can act as standalone instruments. You can connect sample pads directly to an amplifier or PA system because all sounds are generated internally. I have personally used many different electronic drum pads extensively. Although high-end drum pads can carry a large price tag, they are vastly superior to entry level pads. However, more competitive options are coming available and I have included the best affordable pads that are currently available. I am going to tell you the strengths, weaknesses, and purposes of each. I will also do my best to compare important features across models. Do percussion pads look cool live? Yes! Especially if you are a DJ or producer, some spectators can get a little bored if you’re standing behind a laptop or standard sampler. Smacking electronic pads with drum sticks on stage can really spice things up, and add a whole new dynamic of sounds to your performances. Most percussion pads can also communicate via MIDI to other digital instruments or DAWs (Digital audio workstations) such as Ableton Live. This opens up a world of possibilities! The Roland Octapad is one of my most loved electronic instruments. 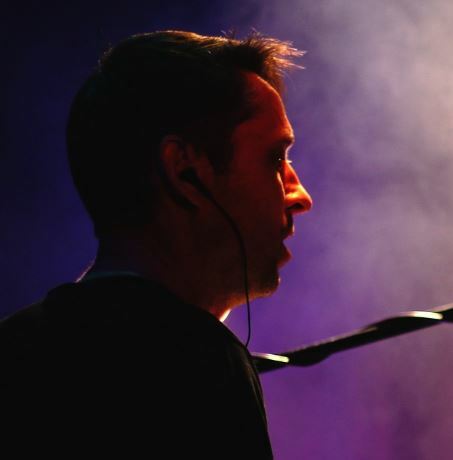 In addition to playing my hybrid kit for bigger shows, the Octapad allowed me to tour around Europe playing electronic music on the street and in small venues with very little hassle. The drum sounds are really excellent in this. A big plus for me is the extensibility of the SPD-30. You can connect up to 5 external sources (including hi-hat controller). So I would regularly make a mini-electronic kit out of this with a kick pedal, hi-hat pedal, and snare mesh head. A ride or crash cymbal pad would also be a great option. The phrase looping is excellent on the Octapad. You can loop 3 separate instruments (kits, synth sounds, percussion instruments, etc) with options to delete, mute, pause, etc. Although you are limited to 3 instruments, you can swap them out on the fly. I started using it a surprising amount of times in my shows! Like many electronic instruments, the starting and stopping of these phrase loops can be midi triggered. Therefore you can use it in conjunction with other samplers and devices. With months of daily playing on this, I never once experienced any crosstalk issues. With a few surprise rain-showers, this device got covered with rain on me a few times. No problems what so ever. The main drawback, you cannot load your own samples on this device. However, there is such a variety of sounds and professional effects, that you can do without it as a drummer. So that’s my love affair with the Roland Octapad SPD-30. What a great piece of kit. If it had the ability to load samples and add more kits to phrase looping, I think it would be almost perfect. The Octapad SPD-30 is a percussion pad. It is built for drummers and percussionists that want to go digital or add electronic sounds to their acoustic set-ups. It is an investment and costs much more than entry-level models. However, the Octapad is leagues ahead of these cheaper options in my opinion. The Octapad SPD-30 is far superior to the previous Octapad model that was produced in the late 1990’s (the Octapad SPD-20). Check out my in-depth review of the Roland Octapad SPD-30 for more information on this. The Roland SPD-SX is another very popular model. The main difference is that this is a sampling pad rather than a percussion pad. So it is more built for drummers that want to play custom samples, expand their own set-up, and for DJs and producers adding more triggered sounds into their performances. The SPD-SX is an excellent instrument. The main advantage that this has over the Octapad is its sampling ability. You can load your own samples onto the SPD-SX. The best way to do this is to prepare your wav files on your computer using audio software (like audacity or more featured options) and then transfer them. The main reason I choose the SPD-SX over cheaper options is that of its build quality and pad triggering technology. With cheaper alternative products you can get crazy cross-talk between pads. An example of this is hitting one pad and another one triggers. This can be a problem for drum sounds, but it is much worse if a wrong sample is triggered in the middle of a performance. If you are serious about incorporating a sampling pad into your setup. You definitely need to invest in a quality model like the Roland SPD-SX. This device has 4GBs of internal memory, allowing for 720 minutes of samples. You can also expand the memory using USB storage. Therefore the total storage here should definitely be sufficient for your needs. Limited storage can be a problem with some samplers, I ran into this with the Korg Electribe sampler, which has a surprisingly limited amount of custom sample storage. One disadvantage is that you cannot create phrase loops on the fly with the SPD-SX like you can with the Octapad. So, buy the SPD-SX or the SPD-30 Octapad? I personally choose both. They are both built for different purposes and perform them beautifully. As a drummer, I prefer the Octapad. If you need custom sampling or use it as more of a secondary instrument then the SPD-SX may be the way to go. 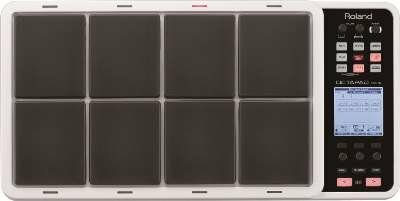 The Roland SPD-SX supports up to 4 external pads (either 2 dual zone pads, or 4 single zone pads). You need to get a splitter if you intend to use more than 2 external inputs. 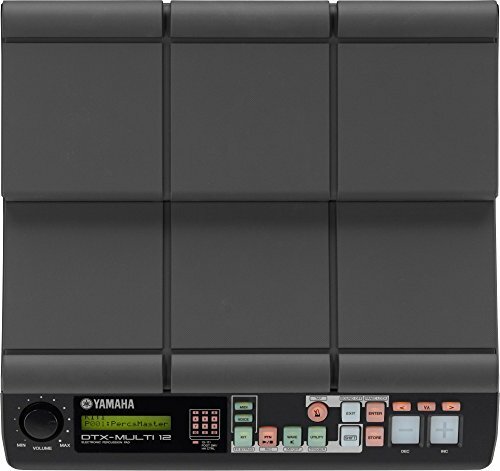 The Yamaha DTX Multi 12 is a Sampling pad that can most closely be compared to the Roland SPD-SX. It has 3 extra pads to the SPD-SX and it has a huge inventory of sounds to choose from. This model has the potential to replace your drum kit and allows you to load custom samples, this is well worth considering. I think the biggest advantage of the DTX Multi-12 is the ultra sensitive pads. If you are into hand drums like djembes or congas, this is pretty much the only option amongst the percussion pads I am presenting to you. The pad surface can seem a little soft when playing with sticks. This is totally a matter of preference though. You can also add up to 5 pads externally. There are 3 inputs but 2 of them are dual inputs, where you can input dual zone pads or split them out to two separate single zone pads each through the use of a splitter. This can make for a compact electronic drum set. Make sure to do your research when choosing external pads. Kick pads and drum pads are pretty universal. But this is not always the case for hi-hat controllers. The DTX-Multi has only 64MB Internal memory for loading custom samples. I see this as the biggest weakness as it is quite limiting. Compare this to the 4GBs of internal memory that you get in the Roland SPD-SX. Using user interface for this model can also take a lot of getting used to. The menu system is a little clunky and difficult to use. There are a lot of features, but it seems to come at the price of usability. This is a solid contender as both a sample pad and percussion pads. As a preference, I prefer the feel and features of the Roland Octapad SPD-30 for my own use, or the Roland SPD-SX for onboard sampling. However, this can serve as a great alternative. This product promises so much at a much lower price point, making digital drum pads a lot more accessible to people with a lower budget. It is packed with features and it can be a great mid-level model. I bought this product for a few reasons. The first was because it allows for lots of extensibility with external pads. Therefore you can make your own mini electronic drum kit out of it. Secondly, you can load your own custom samples on it. It has some really desirable features that you would want from more expensive models. Lastly, the price point. This model is considerably cheaper than other options. If you’re looking for a top-end drum sampler, this won’t fully fit the bill. It’s playability doesn’t fully match the previous models I’ve talked about. However, it can still be a great option. The SamplePad can also be let down by cross-talk issues. If you have the pads set to a high sensitivity, hitting certain pads can trigger other ones. A firmware update helped this somewhat. However, you may need to lower the sensitivity on some of the pads if you are still having issues. It can actually be a very decent option. 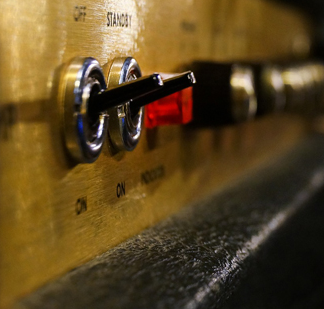 You could load custom samples and have it as a secondary instrument on your kit. This would be at a much lower price point to the Roland and Yamaha models. I did try this out in live performances, and to be honest, it wasn’t too bad. However, it’s not as sensitive as the previous sample pads I’ve talked about. I didn’t really pick up the volume of my strokes as well as higher-end Roland or Yamaha percussion pads. Verdict: This can be a great cheap option to get into electronic sample pads if you don’t have enough money to spend on the Roland or Yamaha Models. If you are picky about the sensitivity of your strokes, this could be an issue. Cross-talk can also be an issue, but you can decrease this a lot if you lower the sensitivity on one or two problematic pads. Check out my more detailed review of the Alesis SamplePad Pro. Note: Alesis also have a smaller version of this, known as the SamplePad 4. The PylePro drum pads and the Yamaha DD65 offer something quite different to the ones previously mentioned. These are lower priced options that are designed for drum practicing and casual use. They have plenty of sounds and include foot pedals and built-in speakers, so you are ready to jam out of the box. These can serve as great gifts to beginner drummers and those that not have dedicated drum sets to practice on. They’re also a lot of fun to play. The pedals are not amazing, but they work well for the basics. Both of these have MIDI outputs, which enable you to connect it to audio software to play. They also have audio outputs that allow you to connect to headphones or external speakers. If you have the choice between the two, I would recommend getting the Yamaha DD65. 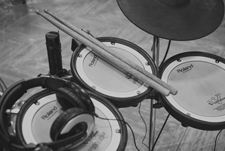 Although they did not make the final cut for this article, there are some other decent options for electronic drum pads. The KAT Percussion KTMP1 is an entry-level option that includes 4 pads. It is a little limited in its features but I do rate this one highly in terms of value for money. The Roland Handsonic is a great high-end hand percussion pad that contains internal sounds for many different styles of music. I did not include it in this article as the device is suited to a smaller number of musicians. There has also been the very recent addition of the Alesis Strike Multipad, which is a serious contender from Alesis as a top premium sample pad. Check out our separate article about that to learn more. Do I need an amplifier? It depends on how you plan to use your electronic drum pads. You can connect the audio outputs to an amplifier or PA system via instrument cables. Most drum pads also include a headphone input. How do I load my own samples? If your drum pad has the capability of loading custom samples, this is generally done via a USB drive or SD card. Check the specifications of your device before loading samples. Some require specific formats and bitrates (e.g. 16 bit wav files). What’s the difference between high-end and low end pads? The number one difference is build quality. You can see a notable difference in sturdiness and quality in higher end pads. This can make a big difference when gigging regularly. As mentioned previously, low quality pads can trigger cross-talk and other unwanted problems. On-board sounds of higher end pads are generally of much better quality. Another major difference is both features and speed of the device, particularly with regard to switching kits while loading external samples. 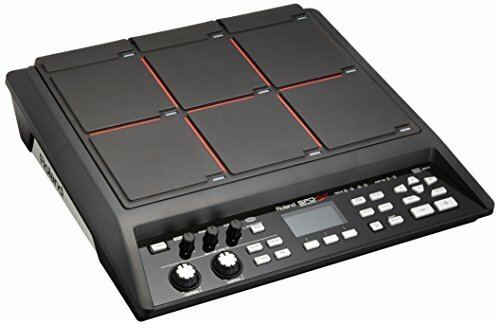 How do I record my electronic drum pad? 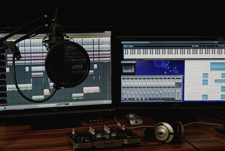 If you want to record your electronic drum pad to your computer, then you will generally need an audio interface. You connect the outputs from your pad to the inputs on the interface via instrument cables. The interface usually connects to your computer via USB. You can also connect most electronic drum pads to computers and other music gear via MIDI. Therefore you can trigger drum sounds from music production software instead of using the on-board sounds on your drum pad. Can I connect other e-drum pads to my sample pad? Check the external inputs of the pad. You may be able to connect other e-drum and cymbal pads, such as rubber or mesh pads directly. Some devices also include a specific input for a hi-hat pedal, which you can use the open/close functionality of the hats. I usually recommend adding a kick pad if possible. So those are the main percussion and sample pads that you should consider. Whether you want to add electronic elements to your acoustic playing or want a standalone instrument or sampler, electronic pads can be a great option to add to your performance. The Octapad SPD-30, SPD-SX, and Yamaha Multipad are the high-end options that are very suitable for touring and performances. The all-in-one options are for more beginner and casual use. The Alesis SamplePad Pro comes somewhere in the middle. If you have any comments or questions on any of the pads in this article then please write a comment below. I promise to answer every comment! 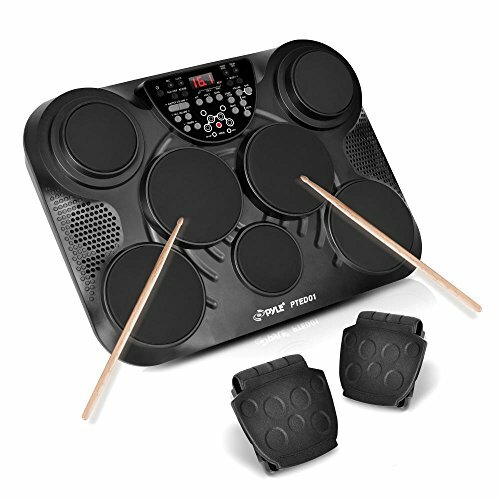 Thinking about buying a full Electronic Drum Set? Electronic drum sets can be a lot more reasonably priced than you might expect. Check out our updated buyer’s guide and reviews for the Best Electronic Drum Sets. They can help replicate the experience of playing an acoustic kit far more than electronic percussion pads. If you are just starting to learn drums then I would highly recommend getting one of these. If you have any questions on Electronic Drum Pads then be sure to ask below. I always answer every comment! 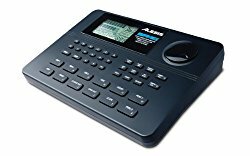 Is the Alesis Sample Pad Pro sufficient for a church choir? Hope there is no unbearable issues. Hi Jaison, it depends on your needs. I think it would do the job nicely for some relatively basic drumming/percussion and playing samples if necessary. The Alesis Sample Pad Pro is fine to put through a PA or amplifier for live situations (I’ve played it live myself). This sample pad has a few quirks that you should definitely practice and get to grips with beforehand, but you should be ok once you understand these (For example, it takes a bit longer than you might expect to switch between kits, and once you figure out how to adjust the sensitivity of the pads then that should eliminate the cross talk issues). Also, keep in mind that the device is not silent, and hitting the pads with drum sticks can cause some audible tapping sounds in close-up and very quiet musical situations. This may or may not be an issue for you, depending on the size of the room and volume of the choir. In my opinion, if you’re planning on doing some intricate drumming with a lot of dynamics then this may not totally suit your needs. So it’s not a definitive answer, as I said it depends on your needs. Though the Alesis Sample Pad Pro has a lot of features and it is a decent one to start with either way, because it’s much cheaper and you can invest on more expensive Roland or Yamaha models later on if really necessary. Hope that helps, if you have any other questions then please let me know! Mike, thank you for the review. I am relatively new to Edrumming. From the research I’ve done this far, it seems selecting components from different vendors is the key? That said, I was considering the MimicPro for sounds, Yamaha gel pads, and Roland cymbals. Can you go in-depth on this thought process? I will ask, in light of this article, can one of these pads be used as the brain for a whole Ekit? If answers are too involved for this forum, please email me. I appreciate the input. Hi Ken, selecting components from different vendors can be a great option if you know what you want. 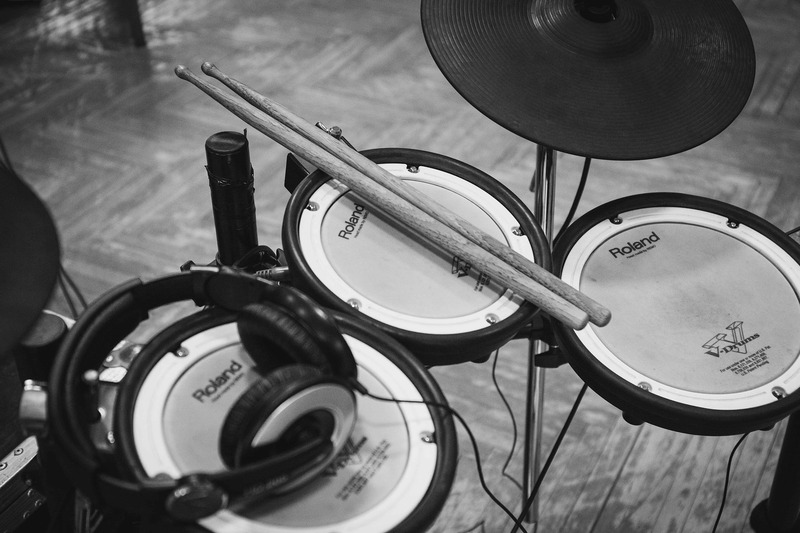 Electronic drum components like pads, cymbals etc, tend to be compatible with e-drum brains of other vendors (however you should certainly do some research into the particular components you are getting to be sure of it). The pearl mimic is supposed to be fantastic, if you have the budget then it’s well worth considering. Yamaha gel pads are also excellent, and some people prefer them to mesh heads, it’s a matter of preference really. If you’re planning on cherry picking individual components, if you have access to a local drum store then I’d highly recommend trying different ones out, as a lot of it is down to personal preference. What might work for people on message boards might not be the optimum choice for you. A negative of using different components is that they would probably come out as more expensive. Btw – not every component in e-drums will be totally compatible across the board, this is particularly the case with hi-hat pedals. The Roland Octapad (SPD-30) and the Yamaha DTX Multi-12 can be extended to use some other pads and a hi-hat pedal, but you’d only be able to make a mini e-kit out of them. The same goes for the Alesis SamplePad Pro, however, I wouldn’t personally recommend that as your main drum-brain. The new Roland SPD-SX wouldn’t really work as a drum brain. 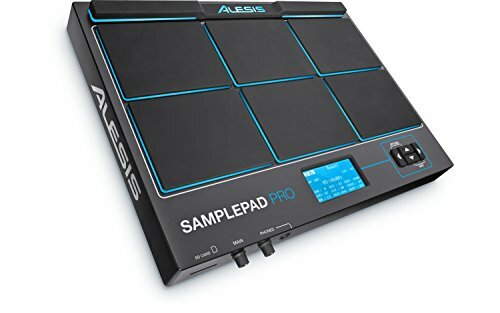 I have been using an Alesis SamplePad Pro with an added kick pedal and a simple dedicated pad for a snare-like addition. There is a little crosstalk… but for the price, it really takes care of business. I always intended to upgrade after a while. I may be thinking about this differently than many because I’m using the device to control and MPC as it’s sound source. I’m haven’t really been too interested in it’s onboard capabilities. Part of me wants to have a pad with no brains and only assignable pads, but there aren’t any. Then it seems to be coming down to alternate pad options. I had planned on the SPD-S / or now the X – since it’s always just been ‘the best,’ but only 2 inputs makes me sad. I already use 2 – and wanted the headroom for 1-2 more. (gotta have some visible reach so there is something for the crowd to actually connect with visually.) So, in my case… it seems down to the Octopad and the Yamaha and I’m afraid the drummer will not like the Yamaha pads – but then the Octapad wouldn’t be a possibility if I moved away from the MPC connection (for samples) — so really, my only choice is the Yamaha – given my requirements of more than 2 external pads and the ability to use samples. What say you? You might have already made the decision on this, but even so, this might be useful for other readers. The Yamaha DTX has 3 actual external pad inputs. 2 of those pad inputs support either a dual zone pad, or two separate pads each. You could expand this to 5 external pads in total if you don’t want dual zone capabilities, but you’d need to buy splitters for the inputs. In the same way, the Roland SPD-SX has 2 inputs, but you could input 4 pads into this if you have splitters. Therefore, the SPD-SX could actually suit your needs in this case. Hi Sampaul, it’s very easy to get up to speed with any electronic percussion or drum pad (The Yamaha DTX pad included). There are plenty of resources online, but the best thing is to just get your hands on one and start playing around with the different sounds. 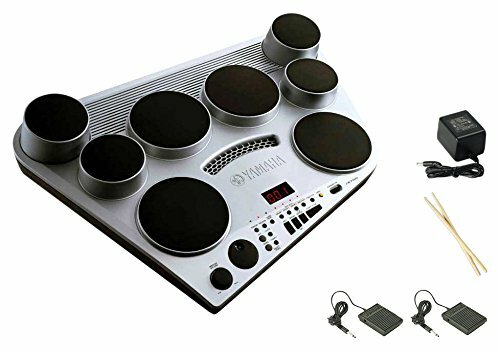 Also – with the Yamaha option, you can play with either sticks or your hands. Hope that helps! Thanks so much for this great review! I play a lot of musicals and am required to use many electronics just to cover all of the required instruments. My current set up is a MalletKat for all pitched percussion midi’d to an older Yamaha DTX v2 drum module. The Yamaha also then is used for some triggered sounds using the pads from the kit the module came on. The only drawback is the lack of ability to trigger samples sounds as sometimes required by musical books (church bell, sound effects, or even burps and farts in the case of “Shrek”. I’ve used an iPad sample player, but the little buttons are a pain – I’d like something to hit with whatever ever stick or mallet I’m using. I’ve already got great sounds in the DTX (even though it’s approaching 20 years old!). So it’s looking like the Alesis would be the best choice. What say you? Hey Don – that’s awesome, having the MalletKey in your setup must be great! I understand your point about the iPad sample player. I always feel it’s a lot better to have hardware to work with, particularly when you’re in the middle of a performance. I think the Alesis would be a suitable for your use, particularly if you’re mainly looking for a lot of one-shot or secondary samples to add to your performance. It’s pretty inexpensive for the features you get. Keep in mind, there are a few quirks to get used to. You particularly don’t want to make sure not to accidentally trigger those Shrek sounds at the wrong time 🙂 I think you can get used to these after playing around with the pad for a while though. If you’re going to use the sample pad very heavily then it might be worth investing a bit more in something like the SPD-SX straight away, but it seems that you’re looking for a cheaper option. It can take a little bit of time to switch between kits on the SamplePad Pro (depending on how big the samples are). That’s something to keep in mind if you have a lot of samples to switch between during your performances. However, that shouldn’t be a problem to work around. New to the idea of electronic drumming and trying to figure out what would be best for me & our band sound. I currently play (and drag to gigs) a set of congas and bongos. After 10 years of lots of gigs my hands are starting to give out a bit and I think I need to make the switch. We play a lot of reggae and soft pop. I also use hand percussion – shakers, guiro, etc — and a foot tambourine, depending on the song. I experimented a few weeks ago with a Yamaha DD-9 (I know, it’s really old 🙂 and that was fun. Can you offer any advice as to which direction I should head to make the switch? Hi Dawn, I think sample pads are a great option for percussion type sounds. E.g. the Octapad comes with a lot of very decent percussion and world music samples and kits. How it can replace your current set-up is really a matter of preference, so I can’t say for sure. There will definitely be differences in feeling and dynamic of the acoustic vs electronic, and there are pros and cons to both. Going the electronic route can offer you so many different options, but if you play primarily on your set of congas for example then you may be able to get more expression on your acoustic set. It’s really up to you to experiment. One option could be to use a hybrid type set-up, i.e. keep some acoustic instruments and then have a sample pad. E.g. if you kept your acoustic bongos, then you could still use the yamaha multi-pads with your hands, as they are responsive enough for this. 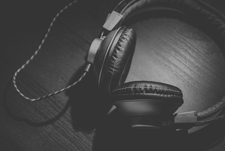 Alternatively, going completely electronic can be very liberating and can really help you focus on building out more sounds! In fact, it could really work with the styles of music you’re playing. Thanks for a superb extremely helpful article Mike! Hi Tommy, glad you found the article useful! The best pads that have very fast switching speed and also allow custom sampling are the Roland SPD-SX and the Yamaha Multipad. I’d personally pick the SPD-SX unless you’re looking for pads that you can play with your hands also. The octapad doesn’t have custom samples, and the Alesis Samplepad Pro is too slow IMO if you’re looking for fast speed switching live. I have never played drums nor I have any drumming experience. I want to learn how to play octapad. What would you recommend for me ? I wish to play using sticks . Once I learn, I plan to play the same in my company’s annual day. I just want a basic octapad which can fit my need. Thanks for the quick response. I appreciate it. Now that I have the resources to learn. I want to buy an octapad. I read your article “The Best Electronic Drum Pads 2018 – A Drummer’s Guide” and watched every single video linked to that article but could not decide . Which one would you recommend for me ? I am looking to buy one during this thanks giving sale hoping for a good deal. Hi Piyush, the Roland Octapad SPD 30 is my first choice in this article, so I would recommend that unless you really need to load your own custom samples. There are already a lot of great on-board samples and options to process the sounds. Apologies for the delay in responding! Hi Mike, thanks for such a great informational article. Your thoughts are really helpful as I’m looking into a kit. I’ve only played acustic drums and percussion, so I’m still trying to figure these kits out. Do these pads need certain firmware or software to use them? Do they run through a computer or tablet? Thanks for the input; I’m pretty excited to get into this side of drumming. Hi Riley, I’m glad you found the article useful! All of these pads are standalone electronic instruments with on-board sounds so you just simply hook them up to an amplifier, PA, or headphones to hear them via standard instrument cables (1/4 inch cables). The necessary internal software is already included on them, in certain cases there are optional firmware updates which you can install through a USB connection but if you’re buying a new model it will likely contain the most up-to-date firmware. All of these drum/sample pads contain MIDI connectivity so you can connect them to a computer and trigger external sounds such as a drum rack on music production software for example. 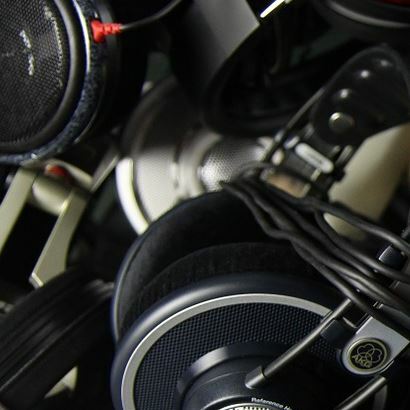 However, in order to run or record the actual audio output (on-board sounds) of your drum pad through your computer you would need an audio interface (e.g. focusrite). I hope that answers your questions, enjoy using whatever drum pads you get.